Preheat oven to 375F. Spray a 9 X 13 baking dish with non-stick spray. In a large skillet, heat the 2 Tbsp oil over medium heat, Add ground chicken and cook until no longer pink (10-12 minutes), breaking up the lumps as it cooks. Drain off any liquid. Add the onion and garlic; stir cook until the onion is tender. Remove from heat and stir in the spinach, oregano, basil, pepper flakes, black pepper, nutmeg, lemon zest and juice until well mixed. Transfer to a large bowl and let cool for 15 minutes, stirring often. Add cheeses to meat mixture; stir to combine. Unfold phyllo dough. Lay the baking dish over the dough and trim dough to fit the dish. Cover this dough with plastic wrap to keep it from drying out. Save leftover dough for another use. Place a phyllo sheet in the bottom of the dish and lightly spray with cooking spray. Top with 7 more sheets, spraying each sheet. 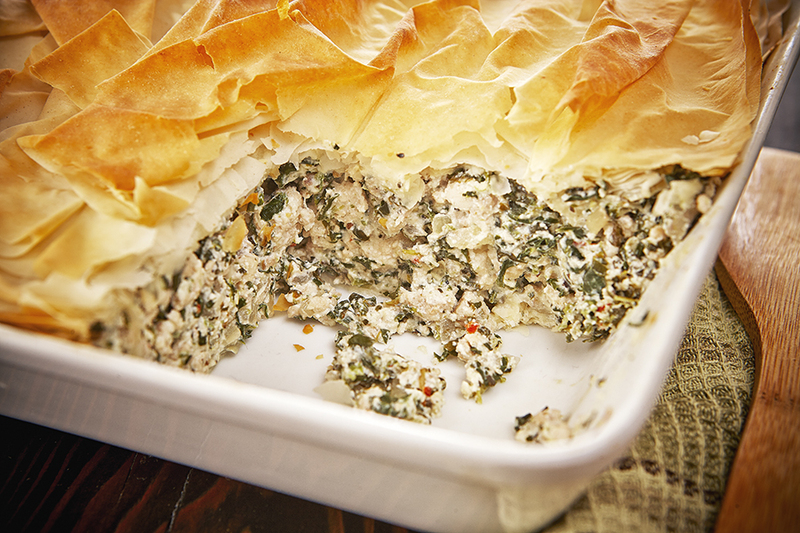 Spread chicken spinach mixture over the phyllo in the dish. Top with the remaining phyllo sheets, spraying each sheet and gently crumpling the top few sheets. Bake for 40-45 minutes or until the meat mixture is hot and the phyllo is crisp and golden brown. Remove from the oven and let stand for 10-15 minutes before slicing and serving.